Acumatica’s integrations with best-of-breed third-party applications have helped make us the fastest growing comprehensive cloud ERP solution on the market today. We credit our ability to meet the business needs of companies in every industry to our thriving Acumatica ISV and Acumatica OEM community. After months of preparation, Acumatica Summit 2019 is underway. Over 1,500 attendees are gathered at the beautiful Marriott Marquis Houston, ready for a week of cloud ERP training, networking, and fun. They started on Saturday with our third annual Acumatica Summit Hackathon, which concluded Sunday afternoon. The applications that came out of it are phenomenal, and you can read about the winning solutions in our Hackathon recap later this week. Also phenomenal was our Sunday night Welcome Reception where we honored our MVP Award winners and opened our Solution Showcase—my favorite part—with a record number of Acumatica ISV Exhibitors. As the VP of Partner Solutions, I’m gratified at the tremendous growth of the Acumatica ecosystem. We’ve now surpassed over 150 technology partners made up of Acumatica ISV and Acumatica OEM partners around the world. In this past year alone, we’ve added more than 50, showcasing the tremendous commitment our partners have for Acumatica’s product and adaptable xRP platform. (Including our latest announcement: Cegid joins Acumatica as distribution partner for France. Of these 150, half are exhibiting at Summit. This is an amazing amount of participation as well as an amazing opportunity—one I’ve witnessed year-after-year—for partners, customers, analysts, and Acumatica team members to meet in person. First-person interactions and hands-on demonstrations truly drive home the value and capability of each third-party application. In addition, 34 ISV solutions have already been certified on the Acumatica 2018 R2 release, which we brought to market last Fall. This is a significant milestone. It demonstrates the commitment of these Acumatica ISV partners to follow through on our product roadmap and to accurately integrate with our current release by undergoing a rigorous validation process and earning them their Acumatica-Certified Applications (ACA) badge. Acumatica is an end-to-end cloud ERP solution because of our seamless integrations with the state-of-the-art third-party software applications provided by our Acumatica ISV partners. Their extensions, which are available in Acumatica Marketplace, strengthen Acumatica’s capabilities, allowing us to meet the specialized needs of customers in every industry. For example, Acumatica’s integration with Tableau through DataSelf Analytics, an Acumatica-Certified Application since November, enables our customers to harness the power of their data across their business and turn it into actionable insights. BigCommerce, the leading eCommerce platform for fast-growing and established brands, will be joining Acumatica’s Commerce Edition as a strategic partner. Through this partnership, BigCommerce merchants will have a more streamlined way to eliminate rework and inaccuracies caused by duplicate data entries, enabling them to focus on selling more product, reaching additional consumers, and fulfilling eCommerce orders more efficiently. With Acumatica ISV Skynamo, Acumatica customers will no longer struggle with lack of synchronization between their ERP and CRM solutions. 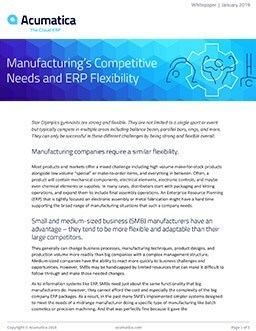 They are bridging the gap between field sales reps and ERP software. Manufacturer, wholesaler, and distributor field sales reps can access product, customer, and inventory information accurately from anywhere and on any device. Mobile and GPS technology also provides real-time visibility and increased efficiency. BlackLine, a leading provider of cloud software that automates and controls the entire financial close process, will now bring Continuous Accounting to Acumatica customers. By leveraging BlackLine’s award-winning cloud platform, the finance controls & automation process will now be a great asset for the Modern CFO and all Acumatica Cloud ERP users. Centage, a leading provider of cloud-based budgeting, forecasting, analytics, and reporting solutions, gives Acumatica’s over 4,000 customers their Maestro Suite. The partnership allows users to build flexible budgets, forecast financial performance, analyze results, and share critical information across the organization and eliminate spreadsheets in the process. “This exciting and seamless integration between Centage and Acumatica will provide users with automated data sharing, delivering robust and accurate financial planning tools for budgeting, forecasting, and reporting,” says Diego Castro, Senior Channel Account Manager at Centage. Are you a future Acumatica ISV or Acumatica OEM partner? I’m looking forward to watching the Acumatica ISV and Acumatica OEM community continuing to flourish as Acumatica continues to enhance our award-winning business management solution. I’m also looking forward to spending time with our current ISV and OEM partners as well as meeting potential technology partners during our Acumatica Summit 2019 Solutions Showcase. If you’re attending, I hope you’ll introduce yourself so that we can talk about Acumatica’s partnership opportunities. I also encourage you to visit the Acumatica Marketplace to get a clear idea of what Acumatica’s complete solution can do for your business. For any questions on Acumatica’s cloud ERP software and platform, please contact our team today.